SANTA CLARA, Calif. -- Hillary Rodham Clinton said Tuesday that if she decides to seek the White House again she would try to bring Republicans from red states and Democrats in blue states into a "nice, warm, purple space" that would encourage problem-solving. Clinton, the leading Democratic contender should she run, referred to her likely presidential campaign in hypothetical terms during an interview on stage at a women's conference in Silicon Valley. But she said anyone who mounts a campaign for president in 2016 should make economic growth and restoring rising wages top priorities, along with rebuilding trust and cooperation in the nation. "I'd like to bring people from right and left, red, blue, get them into a nice, warm, purple space where everybody is talking and where we're actually trying to solve problems. That would be my objective," Clinton said at a paid appearance before the Watermark Silicon Valley Conference for Women. Following a month-long absence from the public stage, Clinton's first U.S. speech of 2015 offered clues to how she might conduct a campaign. She didn't say it, but Clinton's approach would try to accomplish what President Barack Obama has been unable to achieve since his first-term passage of health care reform -- breaking through the logjam of Washington gridlock to tackle the nation's most pressing problems. Presidential politics was an undercurrent throughout her remarks and a question-and-answer session with Kara Swisher, the co-executive editor of technology media company Re/code. During her speech, the former secretary of state encouraged female technology executives to do more to help women grow in leadership. "What you do does not have to be big and dramatic. You don't have to run for office," she said to knowing laughter and applause. "Although if you do, more power to you." Swisher got into the act, drawing laughs from Clinton when she recalled her recent interview with President Barack Obama and expressed her eagerness "to interview another president." Even in the high-flying technology sector, Clinton said, many women struggle in the workplace with policies related to family leave and child care. She pointed to Oscar winner Patricia Arquette's appeals for pay equity at Sunday's Academy Awards ceremony. "She's right. It's time to have wage equality once and for all," Clinton said. "In so many ways, our economy still seems to be operating like its 1955," Clinton said. Describing a challenging economy for many workers, she said "wages no longer rise with productivity while CEO pay keeps going up" and the nation would need to find balance in the economy so all workers could benefit. Clinton did not specifically address whether she would support Obama's proposed authorization in Congress to use military force against Islamic State of Iraq and Syria (ISIS) militants. She said in the interview that "a lot of the right moves are being made, but this is a really complicated and long-term problem." The ISIS threat, Clinton said, is "a very hard challenge because you can't very well put American or Western troops in to fight this organism." 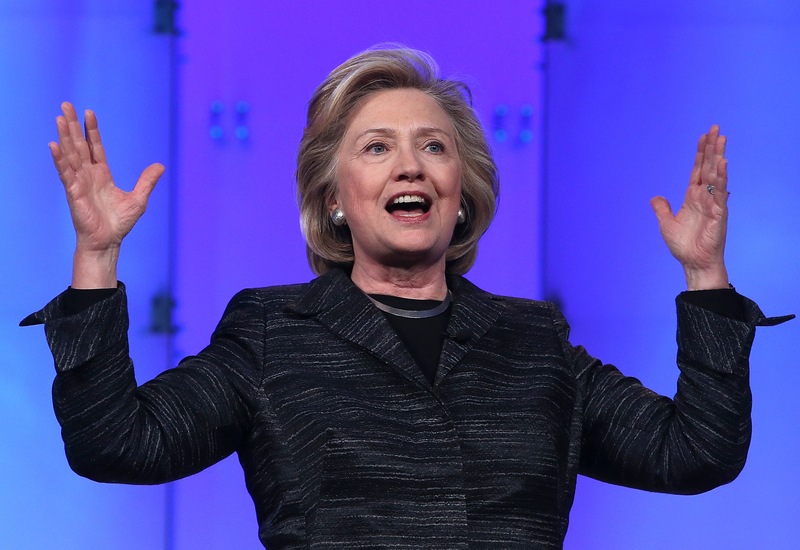 She pointed to the U.S. need for military partners in Iraq and the Middle East. Asked about whistleblower Edward Snowden, Clinton said she could "never condone" what he did. "He stole millions of documents, and the great irony is that the vast majority of those documents had nothing to do with American civil liberties or privacies," she said. Clinton was asked about the impact on the technology sector following damaging revelations that the U.S. government was collecting phone records and digital communications of millions of people not suspected of wrongdoing. She said the National Security Agency needs to be "more transparent" about its activities and act lawfully. The U.S., she said, needs to determine "what the rules are and then we have to make it absolutely clear that we are going to hold them accountable." Clinton said the use of strong data encryption by technology companies required a "balance" with the needs of law enforcement. She also said she supports a Federal Communications Commission plan on "net neutrality" that would put Internet service in the same regulatory place as the telephone. Clinton has kept a low profile so far this year but is starting to take a more public approach as she heads toward her expected 2016 campaign for president. Like the Silicon Valley event, many of her upcoming speeches will address female audiences. In March, Clinton is scheduled to appear at a gala for EMILY's List, which supports female Democratic candidates who support abortion rights, as well as an awards ceremony in Washington for political journalists and a U.N. meeting on women's rights.